I’m Not Too Proud For a Welfare Fish! Last week I closed my report with “I shall keep on keepin’ on!” It worked! Finally! I caught my first sturgeon of the year and I absolutely had the time of my life! This week’s trip was probably my second most exciting fishing trip ever, behind only my record largest sturgeon, but I digress. I launched Wednesday morning, as usual, at Rio Vista. I spent Wednesday sturgeon fishing near Decker Island and just above the Isleton Bridge. I spent over nine hours fishing the first day of this two day trip, and can report with great authority on what didn’t work; grass shrimp didn’t work, eel didn’t work and neither did squid. I have become an expert at what doesn’t work. “FishTracker” Rich of our Fishing Forum and I agreed to meet at Vieira’s dock Thursday morning for breakfast and a day of fishing for the mighty sturgeon. We’ve been fishing together from time to time for well over a year now; things usually go pretty well when ol’ Rich is along. Rich is what I call a Type 1 fisherman. Type 1s actually go fishing at every opportunity. Rich has been fishing the Delta for more years than he’s willing to admit. 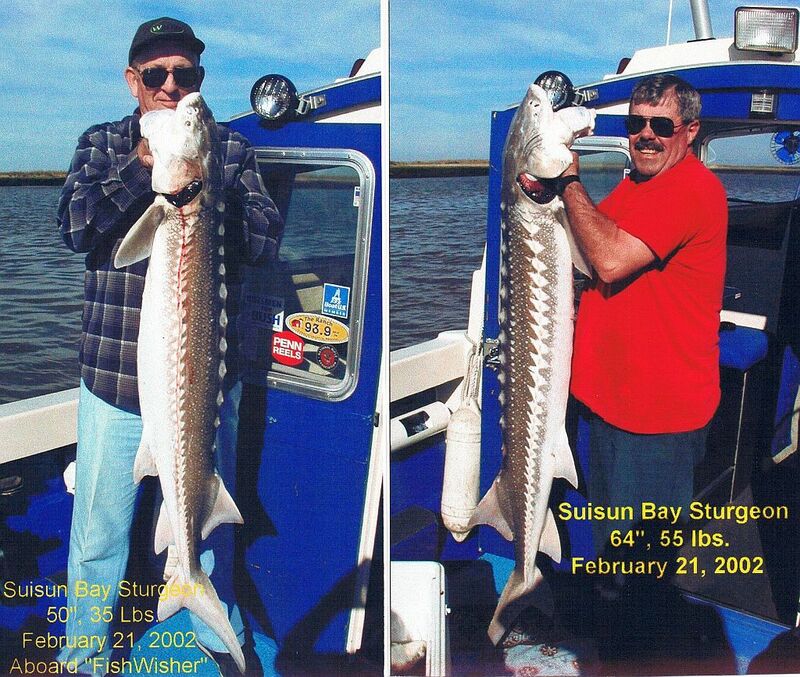 We hadn’t discussed just where we’d fish, but after my umpteenth day of no results the day before, I decided that if I was to catch a sturgeon, we’d have to head for Suisun Bay and the mitten crabs. Rich concurred. I had reached a degree of frustration that even mitten crabs could be tolerated if I could have a better chance of catching a sturgeon. We began our cruise downriver shortly after sunrise, carefully timing our departure to coincide with heavy fog. We idled down the Old Sacramento River using radar, but found much clearer visibility by the time we were below the Rio Vista Bridge. The weather turned out beautiful; blue sky, warm sun and water as smooth as glass. We arrived at Suisun Bay with a half pound of grass shrimp, the unsightly remains of a lamprey eel and a bit of squid. We first tried near Port Chicago on an incoming tide, then motored across to Suisun Cutoff, the area between Roe and Ryer Islands, as the tide changed. We began fishing the outgoing current in high spirits, enjoying a beautiful day and good friendship, no matter the dang crabs. We brought three crabs aboard, all of them caught in the act of stealing our bait and summarily executed on the spot! My sense of justice is keen and swift. After more than three hours of feeding crabs and enjoying ourselves as much as two old fishing buddies can, FishTracker Rich set his hook into a sturgeon and the fight was on! For about twenty minutes Rich fought the sturgeon, to and from the boat about three or four times. His sturgeon was a good fighter, but after three good runs she finally presented herself at the boat, belly up and in submission. As Rich worked her closer to me, I scooped her into the net. She measured 50 inches and weighed in at 35 pounds. I was incredulous! We actually had a sturgeon in the box! She fell for just a few grass shrimp; we were down to rationing our bait due to the thieving crabs. I plainly stated my policy once again to ol’ buddy Rich; “The Captain catches the first and the biggest fish! What’s so hard to understand about that?” He mumbled something about waiting long enough for (garble-garble) no account (garble-garble). I didn’t understand just what he said, and needing a boat ride back to the dock, he didn’t repeat it. I was a bit miffed, to put it politely. I was on my fifth sturgeon trip of the season and was still working on my first sturgeon. Rich was on his first (and maybe last) sturgeon trip of the year on my boat, and caught a mighty sturgeon in about five hours! What could I do but keep on trying? I was convinced by that time to use only grass shrimp and to leave the eel and squid in the bait box. If Rich could catch his on grass shrimp in only five hours, I’d have to use grass shrimp as well. Rich and I agreed before we began fishing that if one of us hooked into a second sturgy before the other had any, that we’d hand off the rod and reel to the fella who… uh… proved he couldn’t catch a fish on his own. This is similar to the “Fishwisher Method” of trolling, where we take turns each time a fish strikes. I struggle mightily to admit that, yes, it was me who needed a welfare fish that day. Within forty five minutes Rich had another big ol’ fish on. I jumped in quickly, grabbed his rod and exclaimed “This one’s mine!” Rich didn’t hesitate to pass off the welfare fish, and the line was whistling off the spool nonstop as my “keepin’ on” efforts finally were paying off! Well, it was me, after all, who had been trying for so long. I don’t know how much line was gone before I finally had my welfare sturgeon slowed and seeking rest, but he had taken plenty. I refused him any rest, forcing him to move my way or to run. He chose to run several times. Finally he was near the boat, and we could see he was easily in the 60″ range, a mighty sturgeon by any measure! Again he chose to run, the surface roiling as he forced himself deeper, this time to the front of the boat! Now, I had just told Rich earlier in the day that I’d never had a sturgeon run forward on me. Yet, there was my monster heading for the anchor rode and I wasn’t liking it a bit. I moved forward with him, having no choice in the matter. I walked the small walkway along the cabin, one hand holding the rod, the other holding the cabin rail, the monster leading me clear to the bow. As if knowing his best tactic, he made a loop around the anchor chain (my entire rode is chain), and then seemed to stop for a rest. I was in an ugly predicament! Either I would get him off the chain or I was going to lose him! “Where’s the switch?” Rich hollered back, both of us now beyond excitement, rapidly approaching panic. I had meant to say right knee, I think. Actually, I wasn’t really thinking — everything was more like a blur by that time. Rich figured out on his own where the windlass switch was, and raised the chain enough for me to see just what my predicament was. By that time, I was bent over the bow rail and, according to Rich, the bow rail was flexing like an Ugly Stik and I appeared to be about to fall overboard. Actually, I had no choice, I had to thread the 7′ rod around the chain once, as I reached far over the rail, not about to give up my long sought sturgeon! I finally freed my line, walked the narrow walkway back to the cockpit, still hanging onto the rod and fighting the fish. He was about to submit, and it was about time! I’d had more excitement that past half hour than any fishing trip in recent memory. After he made a half -hearted run of a few feet, I traded the rod off to Rich for the net he was holding and scooped him into it! The battle was over and we had won! I had kept on keeping on, and it paid off – albeit a welfare sturgeon! And, without ol’ Rich’s help this trip, I would not have landed that big sturgeon. It’s very unlikely that I’d have gotten him off the anchor chain without some help. My mighty sturgeon weighed in at 55 lbs. and measured 64 inches. My efforts were more than rewarded with a catch like this one, my second biggest sturgeon ever! We proudly took photos of both fish and somehow got them both into the ice chest. We cleaned up the cockpit, stowed the tackle and headed upriver to Rio Vista, the ramp, and home. I cannot fully describe the elation that Rich and I felt the rest of that day, and probably for the next day or two. Such a double sturgeon day is mighty rare; it certainly was my first. So, did my first sturgeon of the year take 100 hours as I mentioned last week? Maybe 200 hours? I vowed last week to try to debunk those theories, and for myself, I did. I began keeping track of my hours of fishing for the mighty sturgeon the first of this year. My hours invested for this sturgeon totaled… 63 hours! This was my first measure of time invested in one sturgeon and the numbers really don’t mean a thing, yet. By the end of this season, however, I should have some idea of what it takes in number of hours per sturgeon. The reality is that all those hours, catching a sturgeon or not, are hours spent on God’s beautiful Delta. It isn’t like I had to work all those hours for this fish; not at all, I enjoyed myself every minute of those 63 hours! This entry was posted in Fishin' with "FishTracker" Rich, Fishing Overnight on the Water, Fishing Sturgeon. Bookmark the permalink. Glad to hear you are enjoying summer. After the long delay in posting, I was hoping everything was ok, and am happy to hear that is the case. I very much enjoy the stories.